Okinawa, despite being a part of Japan was like being in a different country altogether. The culture and food are influenced heavily by the Ryukyu history with touches of Taiwanese and Korean due to the proximity of those countries to the island. Also due to the American army bases all across the island, American brands are fairly popular with Blue Seal ice cream, SPAM and A and W fast food being common household names there. While a well-known holiday destination for locals, the island remained foreign to many tourists from abroad due to its accessibility. Last February, I had the pleasure of spending several weeks there, the first couple of weeks on a horse farm in Nanjo, South of Naha and the remaining days exploring the main city. February being the peak of winter for the rest of Japan merely resulted in a pleasant weather with a cooling breeze on sunny days to enjoy at its many pristine beaches and historical and cultural sightseeing attractions. After the farm, I spent a day or two exploring Naha by foot and Yui Monorail. As a solo traveler, it made no sense budget-wise to rent a car and also, my international driving permit had expired by then. It was okay though as it was my first time in Okinawa and I wanted to properly explore downtown Naha. I will save the rest of Okinawa for future trips. My day started out with a hearty breakfast at my hostel, the Kitchen Hostel Ao, located a short ten minutes walk away from Kokusai-Dori and the Prefectural Office station of the Yui Monorail line. Unlike the main cities in Japan, there are no sprawling interconnecting train lines in Naha - only the Yui Monorail. The line connects the city from Naha Airport all the way to Shuri castle and travellers have the option of the island prepaid IC card, OKICA or QR day passes for one or two days. These can be purchased at the ticket vending machine at the stations. From the Prefectural Office station, I took the Yui monorail all the way to Shuri Castle, getting off at Gibo station as it was the closest station to the castle entrance. However you can also opt to get off at the last station of the line, Shuri station if you prefer walking through the park to the castle. When I was visiting Shuri Castle, the annual Momoso Omono Mairi procession was taking place and it drew in massive crowds of tourists and locals. Having originated from the Ryukyu Kingdom, it involved wirshipping Utaki aka sacred sites and the Hinukan aka God of Fire. The event started off in the main castle courtyard before leading on to the numerous sacred sites within the vicinity. Visitors are permitted to follow and take photos but remain a respectable distance to avoid interfering with the procession. Ishidatami Chaya Madama was sort of a hidden jem with a stunning view of Okinawa inland. After the Momoso Omono Mairi, I wandered around the area and on to the Shrikinjocho Stone Path Road. A steep walk down, I found the entrance of the cafe right next to a makeshift waterfall. An English menu was provided by the friendly cafe owner and I ended up feasting on their delicious Okinawa soba, local coffee and the toufu pudding while enjoying the view for over an hour. As I was leaving, the owner asked me where I was from and gave me a gift of Okinawa donuts. After that heavy meal, the long walk back to Gibo station helped to fend off the food coma threatening to roll in. As the stations are open-aired and elevated, the view from Gibo station was enough to make one pause to whip out the camera for a shot or two. Ah, the main shopping street of downtown Naha. On Sundays, the entire road will be closed off to vehicles and open for street performers, art shows and pedestrians to walk around and about the two kilometer street. The temptation to stick to the main street was real but the side streets hold their own secrets too. I found quiet little shopping street selling the reasonable clothing, antiques, fresh produces and kitchenware and bought handcrafted Japanese curry spoons for myself and friends. Along Kokusai-Dori, some main places to check out are Blue Seal for ice cream, Don Quixote for souvenirs, A and W for root beer and Sango35 coffee for their local coffee brew. Okinawa cuisine are miles apart from the typical ramen, tempura and sushi dishes of Japanese food. The food often carry touches of Chinese style cooking and ingredients. Yunangi was a little hideaway restaurant just off the start of Kokusai-Dori, entrance closest to the Prefectural Office station. The entrance was hard to spot but the row of chairs outside the establishment was a good indicator of how popular it can get. I was there early for dinner but as soon as I stepped in, I was surprised by how crowded it was with locals. 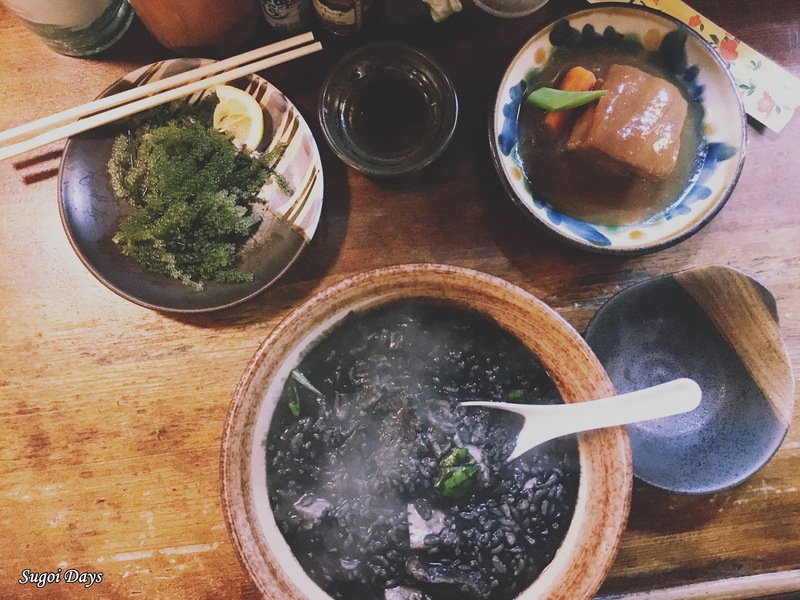 I was quickly seated at the bar and ordered a bowl of squid ink risotto, ratufe and umibudo (sea grapes). The risotto came out more like porridge with chunks of squid. The umibudo was one of the island speciality and was pleasantly refreshing. Fans of braised pork should order the ratufe for the melt in the mouth balance of fat and meat soaked in brown sugar and awamori liquor. Stuffed and filled the brim with the island delicacies and its cultural wonders, I waddled back to my hostel which was just a ten minutes walk away from Yunangi. For late night owls, there are ample pubs and izakayas along Kokusai-Dori that open until late. Sorry, no bullet train to whisk visitors off to this seaside heaven. Flying in is the most economical and fastest way to get to Naha Airport from the rest of Japan. Premium airlines like ANA and JAL often offer fixed reasonable rates for domestic flights for foreigners at about 10,800 yen one way (RM360 - RM400). Alternatively Malaysians can fly into Okinawa via Jetstar through Singapore for a shorter flight at about 5 hours. 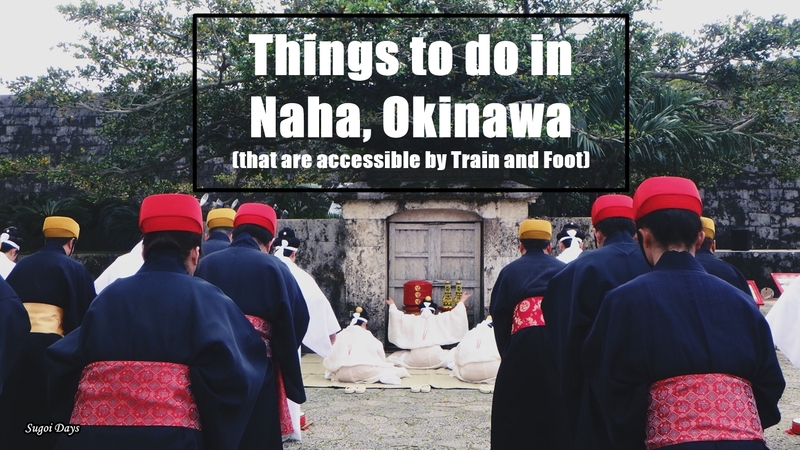 Of course Naha and Okinawa has much more to offer but without a car or a bike, I was limited to public transportation and my own two feet. Had I more time, I would have taken the bus to the other parts of the island but then again, would rather leave some parts unexplored for a returning trip hopefully not alone the next time.